This short Muji fountain pen was taking the Singapore Fountain Pen Lovers' group by storm last year. I remember seeing memebers posting which Muji branch has stock of those Muji fountain pen. It was only recently that I managed to get my hands on one. This isn't the full length Muji fountain pen that I have reviewed a while back, this is the pocket version. The design and finish is different from the full length one so I don't think they are a match set. 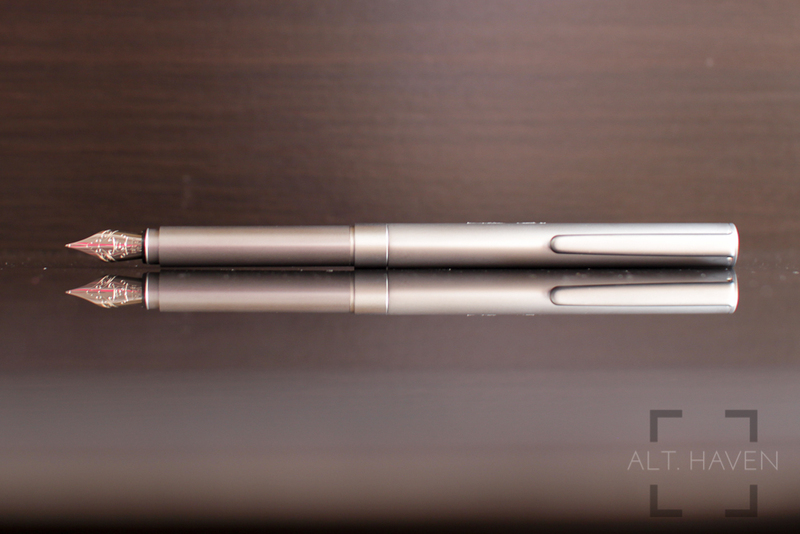 The pocket Muji fountain pen has a sleek grey metal body. This is unlike the full length version which has brushed metal body with knurling on the grip section. The grip section of the pen is rather long and it has the same diameter as the rest of the barrel. It doesn't have the knurling that the full length version has. However given this is a pocket fountain pen, I guess I wouldn't be writing any essays with it. The pocket version's clip is longer and has more tension than the full length one. I would definitely trust this clip over the full length Muji fountain pen's clip. The pocket Muji fountain pen is a short pen but that's solved when the snap on cap is posted on the body. This is one reason why I prefer not to post my pens. Some pens tend to rattle because the cap and the barrel isn't a tight enough fit. The pocket Muji fountain pen is one such pen. The pocket Muji fountain pen uses iridium point nib. It writes well and smoothly but it comes only in a fine nib. The line is lay down is farely wet but not too much that I would complain about it. The nib is pretty stiff and I wouldn't expect any line variation from it. 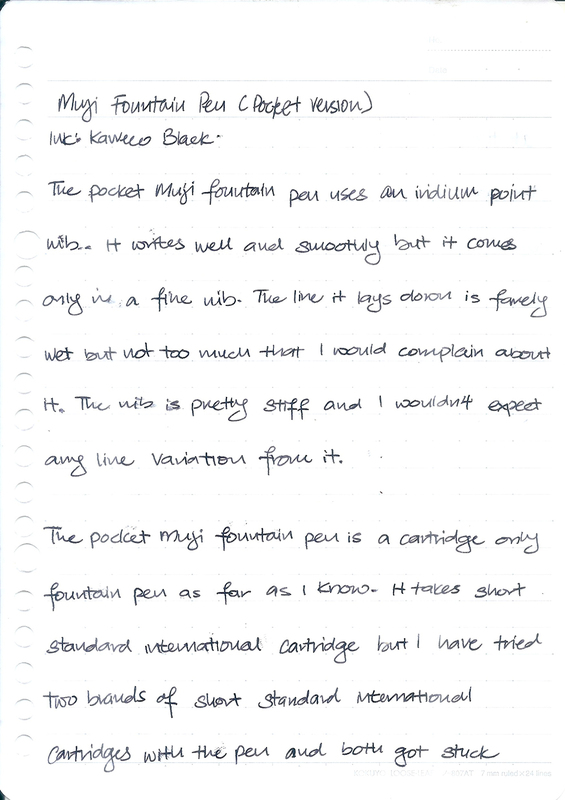 The pocket Muji fountain pen is a cartridge only fountain pen as far as I know. It takes short standard international cartridge but I have tried two brands of short standard international cartridge with the pen and both got stuck at the bottom of the barrel. When I unscrew the pen to check on the ink level, the cartridge would detach from the pen. This is a serious flaw. 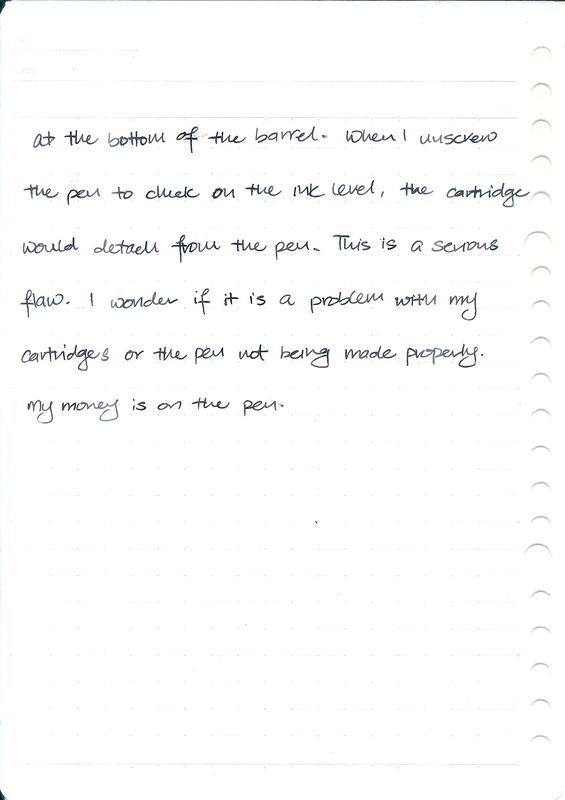 I wonder if it is a problem with my cartridges or the pen not being made properly. My money is on the pen. This is a perfectly serviceable pocket fountain pen however the fact that my cartridge gets stuck is something that I can't look past. If you are looking for a afforable pocket fountain pen that isn't made of plastic you can look at the Ohto Rook. It is a better choice than Muji's offering.